All Of Us Or None Collection, Oakland Museum of California. OAKLAND, CA.- The Oakland Museum of California (OMCA) announced the acquisition of the renowned All Of Us Or None poster collection. Representing one of the most significant social movement collections in existence today, the acquisition of 23,500 posters documenting all streams of progressive activity---covering the 1960s poster renaissance that began in San Francisco, and including almost every political movement in the U.S. between the 1960s and the1990s---reinforces OMCA's dedication to telling the dynamic, multi-perspective story of California. Notable content featured in the poster collection includes: the Vietnam War, the Black Panther Party, the AIDS epidemic, the fight against nuclear power, campaigns to save the whales, veganism, bicycle power---including Critical Mass in San Francisco---and solidarity with Nicaragua, El Salvador, and South Africa to name a few. 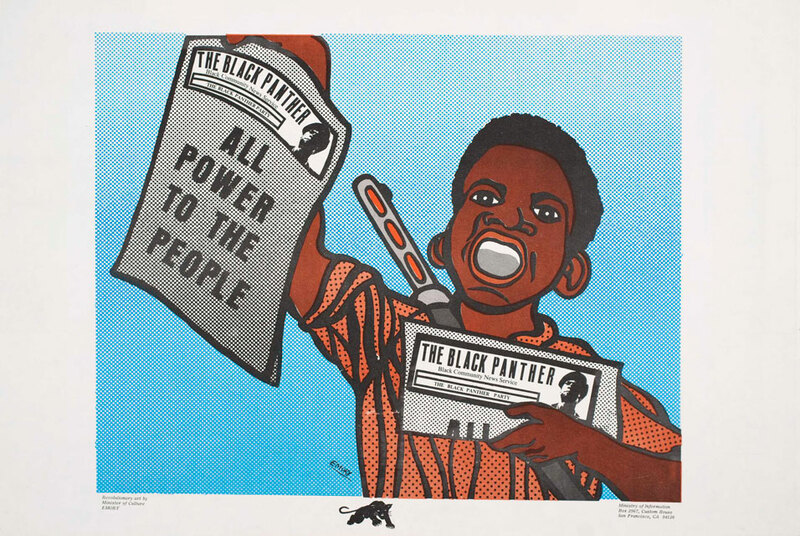 The collection features work by artists of wide acclaim such as Andy Warhol, Rupert Garcia, and Keith Haring; those of note within the poster community such as Malaquias Montoya, Carlos Cortez, and Victor Moscoso; and workshops such as Chicago Women's Graphics Collective, Royal Chicano Air Force, and La Raza Graphics. Though strongest in work from the San Francisco Bay Area, the scope of the poster collection is national, with one-quarter of its holdings coming from out-of-state, including a small archive of international work. The bulk of the collection is focused between 1965 and 1985, with the most significant depth from 1960 to 1970---when the poster renaissance gained its momentum. "OMCA is dedicated to presenting multiple perspectives of our collective human experience," says Museum Director Lori Forgarty. "The All Of Us Or None collection is one of the most significant social movement collections of its kind in the country---comparable with the Smithsonian Institution, the Library of Congress, and the Hoover Institution. It is truly a landmark acquisition for the Museum. Not only is this collection ideal for OMCA's multi-discipline approach to telling the story of California, but our dedication to putting this collection online reinforces our commitment to accessibility." Aptly titled after the poem by Bertolt Brecht, the All Of Us Or None collection comes to OMCA from the estate of Berkeley writer, social historian, and Free Speech Movement veteran Michael Rossman, who dedicated his life to gathering and documenting the collection. It was his intention for the poster collection to remain whole and for it to reside in Northern California---two key reasons for the collection coming to the Oakland Museum of California. "This collection is the keystone for understanding the poster renaissance of the 1960s," says longtime Collection Archivist Lincoln Cushing. "As illustrations these posters are a wonderful and potent way to generate discussion about a subject. The posters are not just a time capsule; however, the Bay Area continues to be a powerhouse in the production of political posters in the world." The Museum is currently working on archiving the collection, with a goal to make the posters available online in a searchable database allowing for collective commenting by researchers, scholars, and the general public alike. In addition, plans for an exhibition showcasing the collection are currently being developed. "Our commitment to putting the All Or None Of Us collection online reinforces OMCA's dedication to engaging visitors in new and innovative ways," says Senior Curator of Art René De Guzman. "It is our goal to create a dynamic online experience for this collection. By integrating social tools with the collection database, we will be able to gather user-generated comments from scholars and the general public (tagging, geo-mapping, audio commentary) in an ongoing effort to document the varied histories behind the posters. It is a robust commitment, and one that we feel is paramount to our mission of telling the ongoing story of California."